Make sure it is certified organic – Organic wool can only be certified if its production can meet federal standards, which include the prohibition of genetic engineering, use of synthetic hormones, and synthetic pesticides. Moreover, forage and livestock feed must be certified organic, too, and livestock health must be assured through good management and cultural practices. This means sheep must not be treated with pesticides and that they can graze freely. Make sure it has not been treated with flame retardants and other chemicals – A high-quality wool mattress pad is free of toxic and harmful chemicals that have been linked to neurological and developmental disorders, fertility issues, and some types of cancers. Wool is naturally flame retardant, so it does not cause flames to spread in case it catches fire (and the flame is easier to put out). Moreover, the mattress pad should not be treated with pesticides to kill dust mites and other insects because wool already naturally repels them. 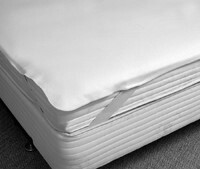 Look for corner straps – A wool mattress pad for regular sized beds will come with corner straps to keep it in place. These features may be absent in smaller versions for cribs.